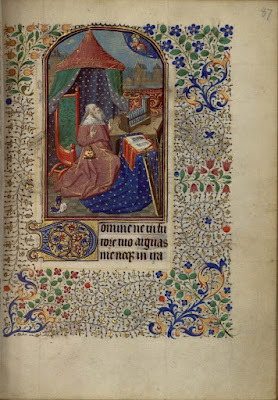 The seven Penitential Psalms are a standard part of the liturgical material incorporated into Books of Hours, along with the Little Office of the Virgin Mary, the Office of the Dead, and the Litany of the Saints. Of course, many Books of Hours are filled with beautiful illustrations, and as a follow-up to last week’s post about the Penitential Psalms in the liturgy of Lent, here is a selection of some of the images commonly chosen to go with them. From the Maastricht Hours, 14th century (Stowe ms. 17, British Library): Mary Magdalene, the penitent Saint par excellence, meets the risen Christ in the Garden; a woman kneels before her confessor, as the hand of God absolves her from above. The bishop on the right is probably meant to signify that the priest can absolve sins only on the bishop’s authority. 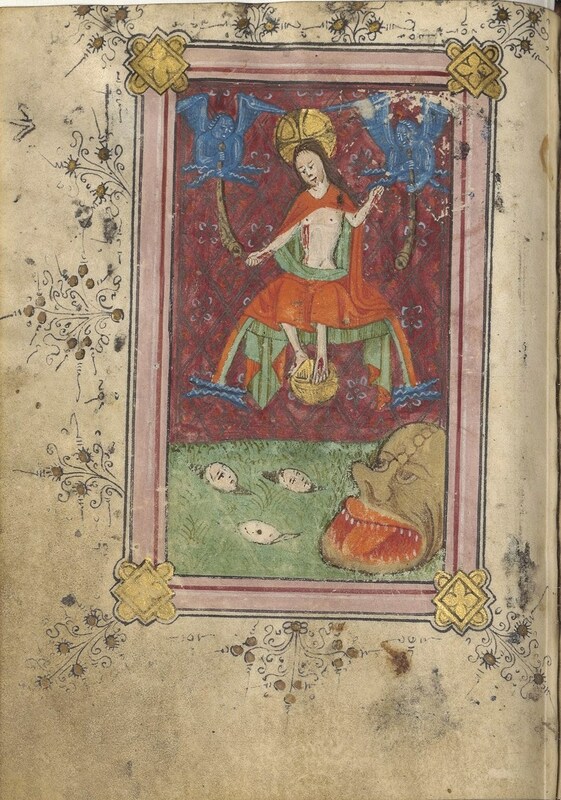 Book of Hours according to the Use of Ghent, 14th century. (Bibliothèque de l'Arsenal, 565, Bibliothèque nationale de France.) 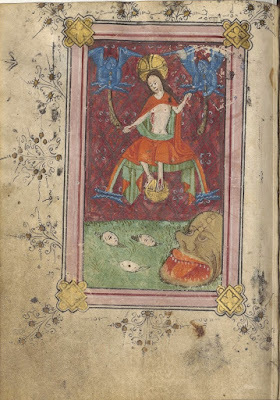 Christ in Judgment at the end of the world, with the dead rising from the earth, and a figure representing the mouth of Hell. 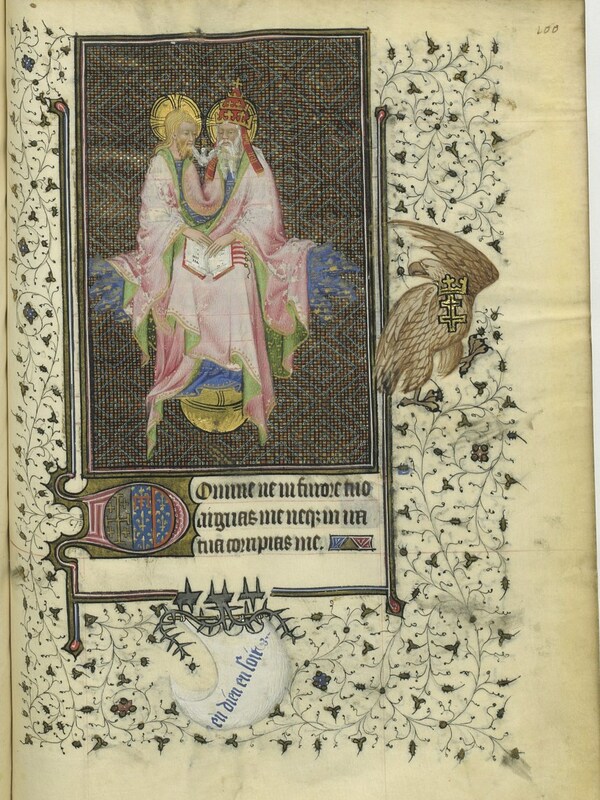 Book of Hours according to the Use of Paris, late 14th - early 15th century. (Bibliothèque nationale de France, Département des Manuscrits, Latin 18014.) The Trinity in Majesty, with the symbols of the Four Evanglists. Below, David, the author of the Psalms, in combat with Goliath, a popular subject with the Penitential Psalms. 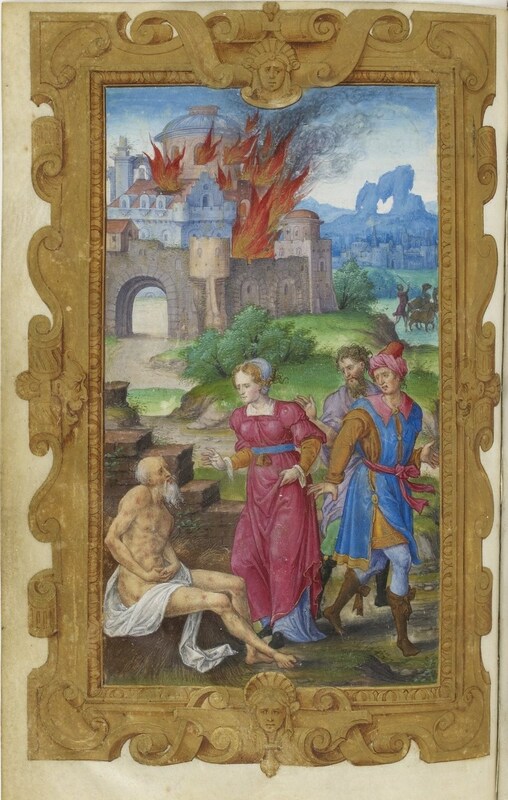 The Hours of Brière de Surgy, 14th century. (Bibliotheque Municipale de la Ville de Laon, ms. 243q.) 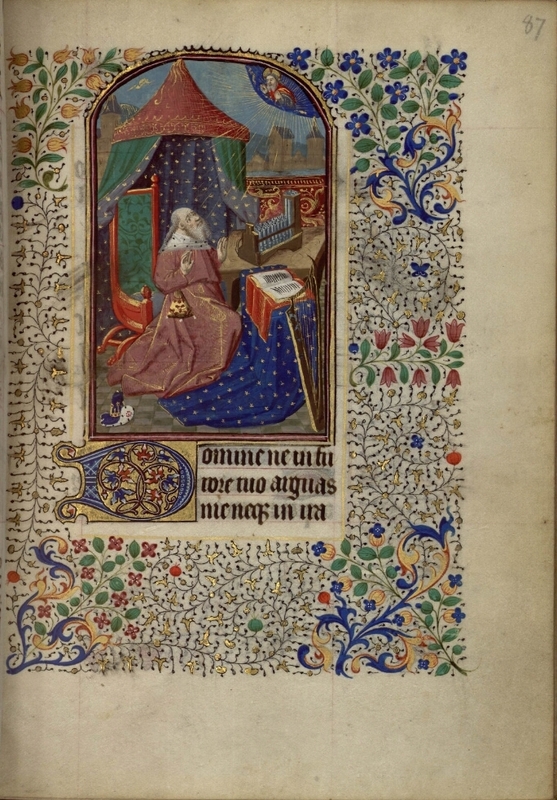 King David as an elderly man in prayer. 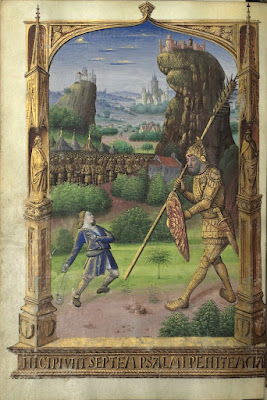 The Hours of Chrétienne de France, 1470-75 (Use of Rouen, Latin and French; Bibliothèque de l’Arsenal, Ms-562 réserve, BnF.) The episode of the census of Israel and the plague which it provokes (2 Kings 24). 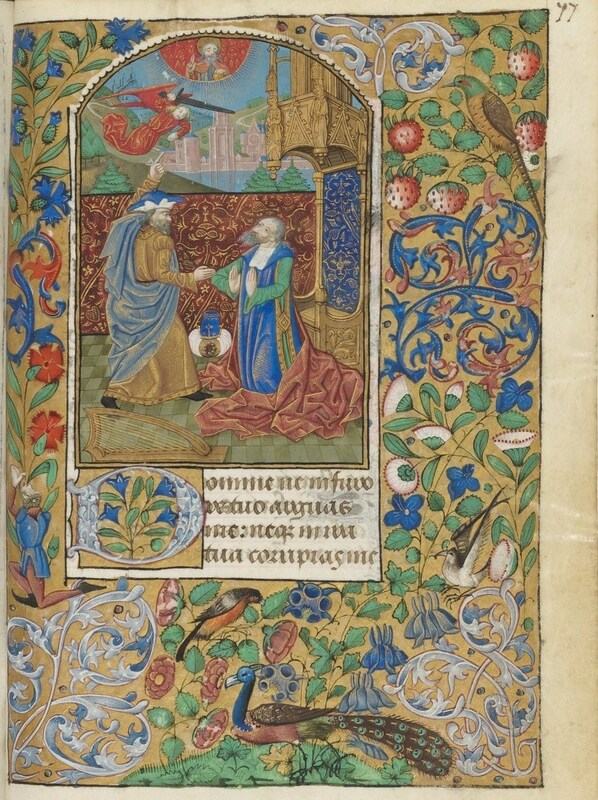 King David kneels before the prophet Gad, with the Angel of the Lord above, whose sword symbolizes the plague. 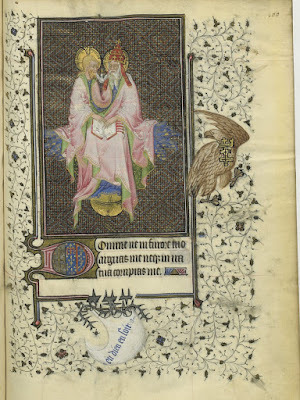 Book of Hours of René of Anjou, King of Sicily 15th century. 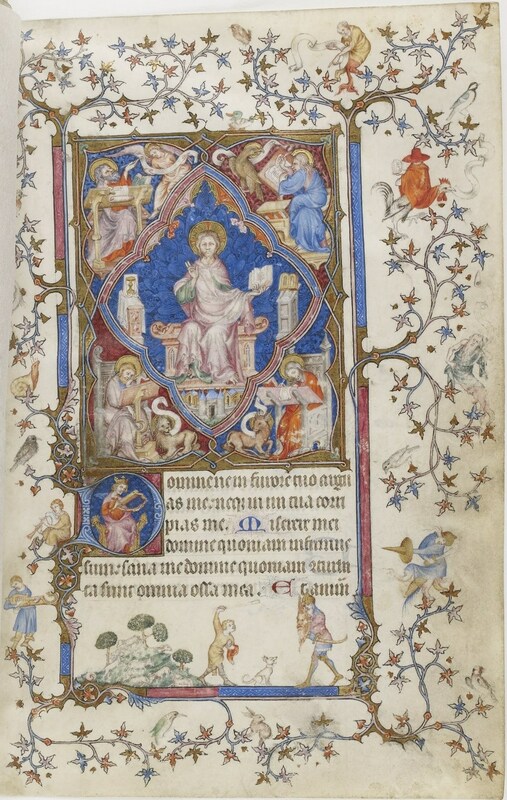 (Bibliothèque nationale de France, Département des manuscrits, Latin 1156 A) The Trinity in Majesty. The Hours of Louis of Laval, late 15th century. 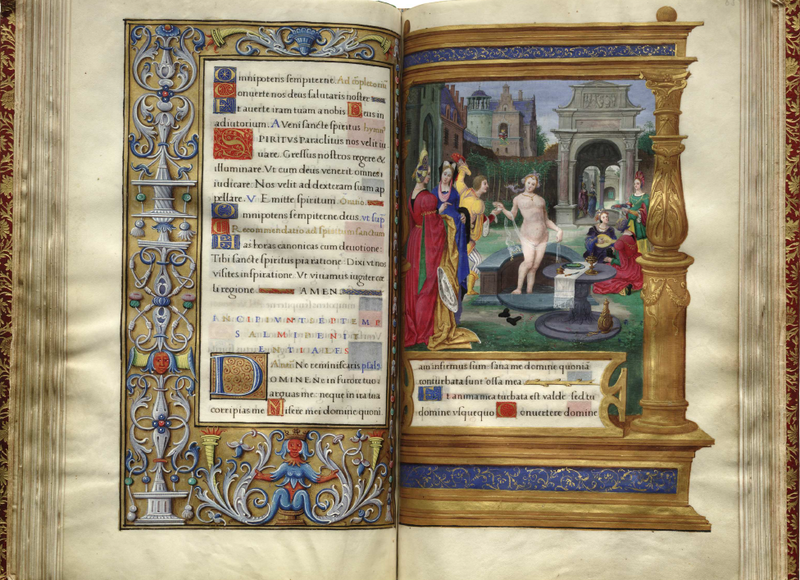 (Bibliothèque nationale de France, Département des manuscrits, Latin 920.) 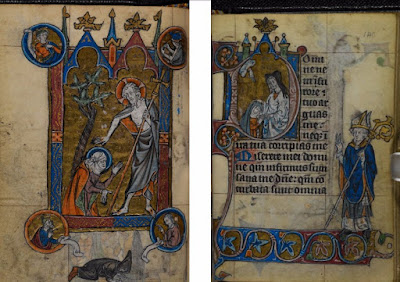 This is one of the most fully illustrated Books of Hours ever produced; every single page has a Biblical scene on it. Here are the two which begin the series that accompanies the Penitential Psalms, the first being David fighting Goliath. Book of Hours of King Henri II, 16th century, (Bibliothèque nationale de France, Département des manuscrits, Latin 1429). Job reproved by his wife. 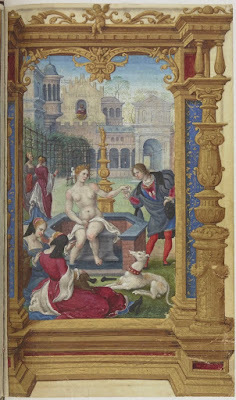 Two more images of the Bathsheba story, first from a Book of Hours according to the Use of Rome, provenance unknown, 1524. 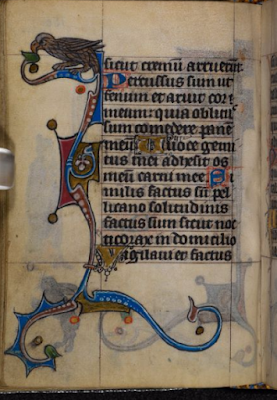 (Library of Congress, Rosenwald ms. 10). 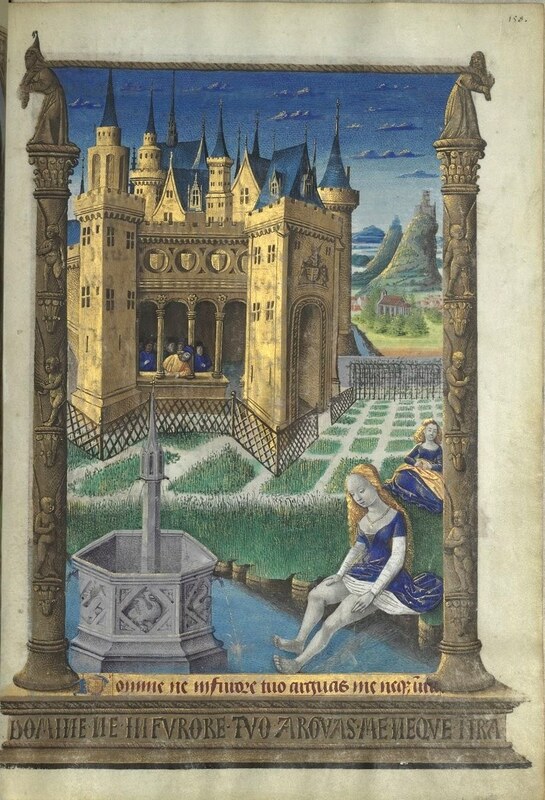 Second, from the Book of Hours of Anne of Austria, 16th century (Bibliothèque nationale de France, Département des manuscrits, NAL 3090).